HOA Hell Archives - Page 3 of 167 - Neighbors at War! 3 Comments on Shadowmoss or Shadowmess? It appears in the first video that an older person with one leg and a wheelchair has been contacted by an attorney over $200 in delinquent dues. The process has begun to foreclose and take his home. There is one really decent man among the homeowners that says he’ll pay the $200 on behalf of that homeowner because the money means nothing to him. THANK YOU MR. CONCERNED NEIGHBOR WITH COMMON SENSE AND A BIG HEART! He does question why nobody on the board bothered to talk to the homeowner before unleashing an attorney on him. The answer seems to be the property manager did it! No Comments on Imagine The Mosquito Liability! The video associated with this news story is actually pretty funny. But the subject matter isn’t funny. Killer mosquitoes actually do exist! In Smyrna, Tennessee, a homeowner is furious because the town won’t do anything about an outbreak of giant mosquitoes in the retention pond behind his house. With Zika, West Nile, Chikungunya, dengue fever and who knows what other diseases carried by these bugs, the lawsuits are going to be flying. Purely by accident Mr. Plumbean changed his neighborhood. I think if he would attend some HOA meetings across the country he could change the mindset in HOA Amerika! Like many of you, I follow the HOA stories that Judy Thomas has been writing in the Kansas City Star’s HOA Hell series. The comments that people make are very interesting and most are supportive of the homeowners, not the HOA. One comment read something like this: “This story reminds me of a book I read in elementary school.” I was so curious I asked for the name of the book and she wrote back The Big Orange Splot by Daniel Manus Pinkwater. 1 Comment on Yet Another CAI Lie! Egads! I hate to publish links to CAI press releases. As I do this, just remind yourself that CAI rhymes with lie. The Community Associations Institute just loves to help struggling seniors, right? That’s what they’re trying to pretend right now. They’re going to help pack meals for low-income or struggling old folks. 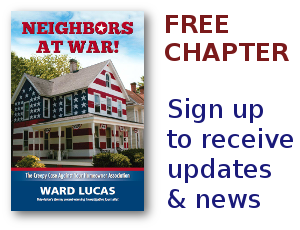 If CAI really wanted to help seniors, then they’d start advising some of their hundreds of thousands of member Homeowners Associations to quit fining, liening and confiscating the homes of seniors who are too weak to fight the petty dictates of the local lawn Nazis. This Is How We Treat Our Veterans?!? No Comments on This Is How We Treat Our Veterans?!? Being an injured veteran, back home from fighting our wars abroad, you’d think Americans might be a little more understanding and compassionate. But the tiny-minded Water Oaks neighborhood on Florida’s Emerald Coast apparently feels like it’s a little too good for a lowly former Army NCO. Sgt. First Class Shane Jernigan is a first class fellow. His neighbors are acting like a bunch of slimy low-lifes. Jernigan has been in one fight after another as his Homeowners Association tries to make him so miserable he’ll leave. But he’s a fighter. This HOA and its law firm (one of the most notoriously litigious in the whole state) is trying to spend him to death.